1. As a paying Plaintiff / Defendant in business cases since 1996 and up to 2009 .As the plaintiff in 2 large cases resulted in remarkable written judgments and the creation of new law. Case no 1 resulted in me spending 40 days in the High court and created huge costs orders for Dublin City Council and the rate payers of Dublin had to pay out one million Euro to two sets of legal teams. 2. The second case involved ACC Bank and a protracted legal dispute over 5 years and saw the Banks legal teams rack up 4 million in their costs and my costs were 800 Thousand euro and I did not recover these costs despite me winning the case. The bank were found to have overcharged me 1.2 Million and no Banker was convicted or held accountable for theft or fraud. 3. Since 2009 I have been a self-represented litigant and have had various appearances in both the High Court and Supreme Court as Plaintiff and Defendant. I have also been involved as a case manager in a large and varied rang of cases. I am setting out the above story to demonstrate my experience and observations as an experienced consumer of Court services. 4. Since 2006 I have been the Chairman of Friends of Banking Ireland an organisation set up to catalogue wrong doing of Bankers, the Central bank and Patrick Neary former Regulator in the years before the Financial Crash of 2008. In 2008 and 2009 I spoke twice before Dial Committees. 5. Since July 2013 I have been the Spokesperson for ‘The New Land League’ a newly formed people’s movement. I have also engaged with other groups who assist people facing appearances before the Courts as defendants in banking cases and also family law cases and other case types. 6. All of these organisations have identified issues and patterns to conflicts of interest of judges across all courts and the failure of judges to’ Voluntary Rescues’ themselves. 7. I have been personally involved in numerous cases in the Irish Courts and have direct knowledge of many more. I have been struck by the fact that there has been only one case that of Mr. Tom Darcy in which there has been a finding against a Bank on any substantial issue. Litigants have repeatedly raised issues of the securitization of loans, the sale of loan books to vulture funds, fraudulent compilation of documents on the part of bank officials and have done so supported by credible evidence such as would be admissible in the courts of any other jurisdiction especially in Europe. In most of these cases litigants have been unsupported by lawyers as the cost of legal representation in Ireland is beyond the means of the people in Ireland. This is a concern raised repeatedly by the European Commission and the Troika, and which this Government has not addressed. 8. As a result of several cases in which it has come to light that the judge assigned to hearing the particular case had or did have a pecuniary interest in the outcome of the case I have suggested to litigants that they raise this issue with the relevant judge and ask that judge to recuse him or herself from the matter to avoid any possibility of bias or indeed the perception of bias. By pecuniary interest I mean not merely having an ordinary mortgage with a major bank but e.g. being a shareholder of bank or having significant personal borrowings with a bank which may or may not be in default or borrowings relating to property development. In other cases it has come to my attention that the spouses of judges and/or their partners or members of their families have had or have to date significant borrowings with banks relating to property development and the like. To the best of my knowledge these interests have not been declared in advance to the parties in advance of any hearings in which the selfsame banks have been parties. 9. Mr Justice Hogan clarified a conflicts of interest issue for the Judiciary and endorsed with refinement current Supreme Court precedents on the 29th of April 2013 in the case of Irish Life and Permanent plc and Dylan Dunphy 2012 No 58C. At paragraph 6 of his judgment. This now sets and clarifies the law very clearly for judges to follow. Council of Europe Fourth Evaluation Round for Ireland , Titled Corruption prevention in respect of members of Parliament, Judges and prosecutors. Adopted on the 10 October 2014. Overview of the judicial system. The report publishes for the first time an in-depth Exposé of our Judiciary and the legal system they operate and reflects and exposes for the first time many of the concerns of the citizens in day to day dealings with the court system. 10. For the purpose of this statutory Declaration I welcome this Evaluation Report and reference paragraph 149. 149. The principles concerning and the circumstances in which a judge should Recuse himself/herself are set out in case law .Moreover, it is established practice for judges to recuse themselves in case where they have an interest, or where there are grounds on which a reasonable person might fear that in respect with the issue involved s/he would not get an independent hearing. Any party to proceedings may apply to a judge to recuse himself/herself where there is an apprehension of objective or subjective bias in the case. Failure by a judge to accede to such an application, where justified, would be grounds for setting-aside- on an application on appeal. The GET acknowledges that there is clear case law for situations of conflict of interest or potential conflicts, which it would be useful to include in a future code of conduct for the judiciary. NOTE: In Ireland you cannot judicial review a judge of the high court. 11. It is very clear that some Irish judges do not practice what is required in Irish law and furthermore what is required in European law regarding serious conflicts of interests. 12. I and others have taken the opinion of Counsel from other jurisdictions on the issue of pecuniary and non pecuniary interests which should lead a judge to recuse her or himself from hearing a case. We have been advised that any pecuniary interest should be treated as an absolute bar to being involved in a case and that even a mortgage or insurance policy would be declared by a judge in advance of any hearing so that the parties consider whether there might be actual bias or the perception of bias such that it would be proper for the judge to recuse herself from the case. It has been indicated to us that the range of interests that might give rise to the perception of bias is extensive and is dependent on the circumstances of any given case. What is important is that there is transparency on the part of every judge such that the administration of justice is not brought into disrepute. 13. 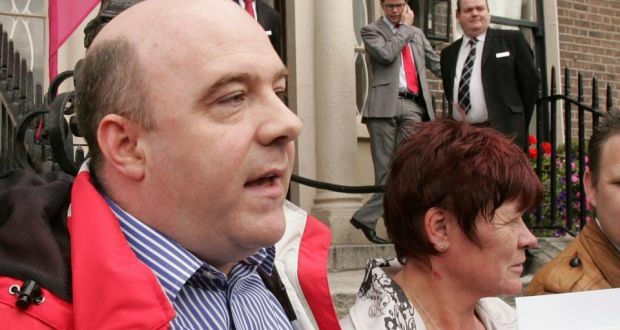 Matters have come to a head in the case of Brian O'Donnell currently before the courts. In that case the judge involved has been asked to recuse himself on the grounds that he has interests with or touching upon the bank concerned such as could give rise to the perception of bias. I list those interests whether personal or through members of his family or other connections in the Appendix attached hereto. All of the information appended is taken from public sources and as such is verifiable by anyone seeking to follow the leads that have been followed by myself and others. 14. The material attached suggests that in this particular case there is ample evidence that the judge has such interests as should lead him to recuse himself from this particular case and also suggests that he should not have been involved in any case in which the Bank of Ireland or the Receiver Kavanagh Fennell was a party As more information emerges as to these interests it is certainly open to litigants whose cases already have been determined to raise anew the entire basis of the hearings in which judgments were entered against them That should serve as a warning to all parties involved in financial litigation. In the end, if information comes to light sufficient to suggest that a judge did have a pecuniary interest in the outcome of any case of whatever kind or of whatever value then every judgment in which that judge may have had an influence must come under scrutiny. It delivers deep uncertainty into the heart of the system of justice and opens Ireland to scrutiny by international bodies such as the European Court of Human Rights and European Court of Justice. 15. We do not raise allegations of corruption or suggest that in any particular case there has been undue influence brought to bear on any judge or that any judge has acted corruptly. We simply do not know the details of all cases in which a judge with a pecuniary interest in the outcome has taken part. It is not necessary for any litigant to prove that there was actual bias on such cases as that is almost impossible to do dependent as it is upon the state of mind of the judge concerned. What is important is that justice must be seen to be done impartially and transparently and that every judge must be seen to above the fray and not have any interest in the outcome of a case. 16. It is with regret that we have to bring to public attention matters concerning the financial arrangements of any particular individual. However these are all public records and as such have no bearing on any expectation of privacy that any individual, whether a judge or not, may have. The holding of high public office brings with it concomitant benefits in high salaries and other financial benefits as well as public esteem. It also brings with it the requirements of transparency and evenhandedness. A judge or other such official may well have considered whether it was proper to be involved in e.g. property development as to do so would inevitably involve her or him in financial speculation and the inevitable perception that s/he would be inclined to favor those parties that were likely to produce a gain to her or him or disfavor them perhaps where s/he had become a loser behind the scenes as property bubbles collapsed. 17. It is incumbent on the Government and the Oireachtas to examine the present situation with urgency. While the case of property in Gorse Hill has focused attention on these issues thousands of people are facing action by banks and funds who have bought loans from banks on a daily basis not knowing whether the judge hearing the case is in fact indebted to the self same bank or fund and fearful that if s/he does not provide the result that the lender requires s/he will not find themselves in financial trouble as a consequence. The papers attached hereto show at the very least that there is a need for an inquiry preferably conducted by persons outside the State into the financial affairs and dealings of members of the judiciary in Ireland in recent years. There is a dangerous perception abroad fanned by a lack of transparency as to the financial dealings of judges that the system of justice is not fit for purpose especially when it comes to financial litigation. A fair system of justice and one that is perceived to be so is the cornerstone of democracy. 18. The New Land League calls on Government to take immediate action through the Attorney General and the chief Justice to correct this constitutional matter.